The Peer Review Oversight Board’s Task Force has drafted the “AICPA Peer Review Board 2007 Annual Report on Oversight,” on which attendees at the August 28 meeting were asked to comment. Mr. Sadler noted that the last annual oversight report from the Peer Review Board (PRB) was distributed in 2003. 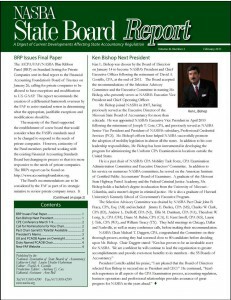 While Mr. Sadler thought the 2007 Annual Report “is very close to what we have envisioned for the Compliance Assurance Review Board’s reporting model,” he also pointed out that the PRB was “not independent and should say so — or restrict the report to internal use only.” He explained, “The report looks a lot like an engagement for agreed upon procedures under the attestation standards, but those standards require independence and the use of the report is restricted.” Susan S. Coffey, AICPA vice president of audit quality and professional ethics, and Mr. Sadler will present a session on developments in peer review and compliance assurance at NASBA’s 100th Annual Meeting.